Charlie’s Promise by Annemarie Allan is a book for young readers (age around 8-12) and follows young Charlie and his friend Jean as they try to help a boy they find hiding in the woods near their home. The boy, Josef, is filthy and starving and can’t speak any English, He gives the children a scrap of paper with an Edinburgh address on it. Although they don’t understand Josef, they know that they need to try to help him get to this address and Charlie promises to help him. The author has created characters that I think her young readers will really relate to. Charlie is a bit of an outsider, with his lame foot meaning he can’t always keep up with the other boys. Jean is a feisty character and I liked that she was a Baird (like me!) so imagined her as some distant cousin. They are both willing to break the rules a little to help Josef. From the prologue, the reader knows that Josef has escaped Danzig just before WW2 as the Jewish people were forced from their homes and is completely alone after having been put on a boat by his mother in an attempt to get him to safety. I think that there would be a lot of talking points for children as they read this book. Although they will probably be aware of the Second World War at that age, they might not know about events leading up to it and the persecution the Jews faced. Through the terror clearly experienced by Josef, they might come to an understanding of what it could be like to be forced from your home. This in turn could lead to conversations about the refugee crisis and why people have to flee their homes, which is sadly just as relevant today. The book has a lot to say about treating people with compassion. Even though the children couldn’t communicate properly, the kindness of Charlie and Jean meant they were able to form bonds of friendship with Josef. Annemarie Allan recently wrote a guest post for the blog about her East Lothian setting which you can read by clicking here. I thought that she brought the village setting vividly to life throughout the book with the harbour, the pit, the mine-workings, the school yard and the housing all easy to imagine. It was interesting reading about the children’s impression of Edinburgh after they travel to Princes Street by tram. Living in the city it’s easy to forget just how spectacular it is but seeing it through the children’s eyes as they are amazed by the castle towering over the gardens and the huge beautiful buildings reminded me that it is a very special place. Charlie’s Promise is a story of courage, friendship and adventure as the three young friends take on the challenge to get Josef to a place of safety. It’s a book I would have enjoyed reading to my children when they were younger and I’m sure that young readers will relish the tale of Charlie and his determination to keep his promise. My thanks to the author for offering me a copy of her book. 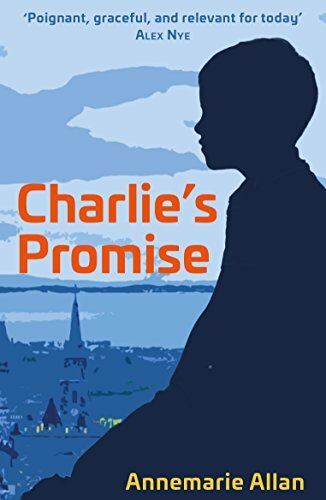 Charlie’s Promise was published in paperback and as an e-book by Cranachan Books on 19th March and you can order a copy online here. On the outskirts of Edinburgh, just before the outbreak of WW2, Charlie finds a starving German boy called Josef hiding in the woods near his home. Josef can’t speak English and is desperately afraid, especially of anyone in uniform. Charlie promises to help Josef find his Jewish relatives in the city. It’s a journey that will force them to face their fears, testing their new-found friendship, and Charlie’s promise, to the limit.